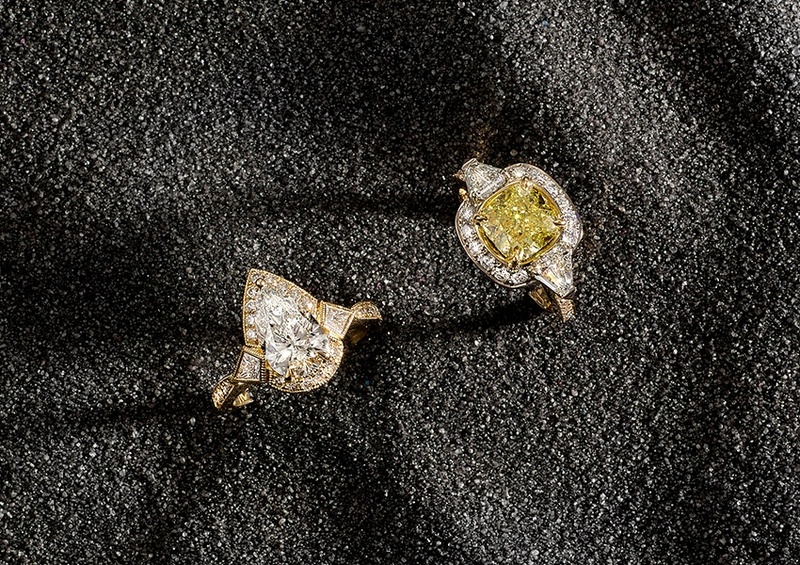 Historically, yellow gold was the norm in bridal jewellery, however the enormous popularity of platinum and white gold during the 1990’s have allowed for yellow gold to be considered as emergent and unique. The warmth of the gold adds softness to the overall appearance of any piece of jewellery, particularly when compared to the more modern silver toned metals. The most interesting aspect of this new trend is its correlation with the increase in popularity of yellow diamonds, which are currently the fastest growing sector overall for diamonds. Within the tone of yellow, lies many variations with combinations such as green yellow, orange yellow and brown yellow, in differing intensities of colour. When creating a bespoke engagement ring, it’s incredibly important to me to ensure that we are incorporating unique cuts and colours to create something truly special. It makes the process exciting and more challenging when we consider the depths of colour and beauty offered by combinations of fancy yellow tones. We strictly abide by the Kimberley Process when acquiring our ethically sourced and conflict-free diamonds. Whilst white diamonds achieve maximum scintillation when precisely cut, in yellow diamonds it is most important that the cut allows for optimal colour intensity, in order to achieve the most attractive face up colour. This is the biggest point of difference between white and coloured diamonds which focus on precise cuts in order to achieve quality. In our latest collection, we have incorporated both yellow gold and yellow diamonds in our spectacular cushion cut diamond engagement ring. If you’re interested in adding a touch of warmth into your engagement ring, please contact the boutique to arrange a complimentary consultation.